You see this second group of people. fear them. Do not dine with them even with a long spoon. Infact, if the dangerous reptile known as the black Mamba were to visit you in company of these 'Nigerian peacemakers', do not hesitate to club them to death while you go clubbing with your black mamba friend. "But Ojukwu shouldn't have tried to break the country nah! The Igbos should have remained with their fellow Nigerians. Don't you realise we are better off as one united country"
This fake peacemaker will never talk about the unprovoked slaughtering of Igbo sons and daughters in the North which started as far back as 1945 in Jos and followed by another major pogrom in Kano in 1953 years before Nigerians even got her independence. This morally bankrupt recession-brained Nigerian peacemaker will never blame those who killed and still kill Ojukwu's people which was what forced Ojukwu into declaring Biafra after all his effort at peace were rebuffed by the then president, Yakubu Gowon. Hearing these 'Nigerian peacemaker' talk about the Biafran war, you'd be forgiven to think Ojukwu just woke up from a terrible dream and simply declared Biafra. Igbos in the North were killed by northerners with state-sponsored impunity. There are recorded instances where those killing were supervised by Nigerian soldiers. And this was long before the 1966 coup even happened. There were several attempts by Ojukwu to get Gowon to take actions to protect the Igbos in the North. There were signed agreements like the one in Aburi where they all laughed, hugged and drank champagne together only for the Nigerian side to come back and jettison the agreement. They could have told Ojukwu that they needed some amendments done on the agreement if they felt they could no longer implement it but they unilaterally dumped the agreement. 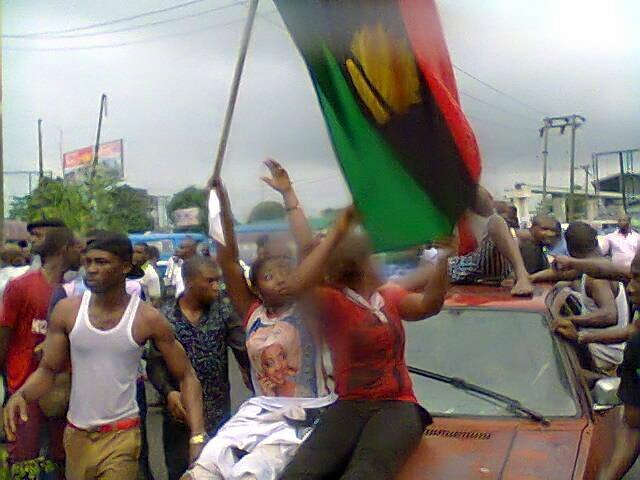 And the Igbo pogrom continued unabated. The Nigerian peacemaker would pretend he doesn't know these. When Igbos made efforts to run from the North, they were chased down to the motor park and slaughtered by northern mob and soldiers. Pregnant women had their womb cut open and their babies removed violently after being killed. These are all verifiable facts. Those hate-induced state-sponsored killings were exactly what forced the first Nigerian Oxford product to join the Nigerian army, Dim Chukwuemeka Odumegwu Ojukwu to declare Biafra in a bid to stop his people from going into extinction. The Nigerian peacemaker would pretend to be unaware of this fact. The Igbo man is being treated like "The Deplorables", demonic economic policies have been introduced specifically to ensure his business is destroyed completely. While the army is killing the unarmed IPOB members and bathing survivors with acid, thesame army is busy protecting terrorist fulani herdsmen with a 1000 man military taskforce and gifting boko haram with Amnesty. While every known rule and law has been broken in a bid to jail an Igbo son, Nnamdi Kanu, who has never killed a fly, a very powerful terrorist group (fulani herdsmen) ranked the 4th deadliest in the world is being protected by the govt and even paid a very large amount of money to stop killing innocent people and boko haram fighters jailed by the last administration are being released back into the society. What manner of injustice is this????????????? What manner of people would endure this kind of grave injustices???????????? If Nnamdi Kanu were to be a Northerner, would he still be in jail?? Would he even have been arrested in the first place?? In all of these, the Nigerian peacemaker will never blame the perpetrators of this moral tragedies, he will rather hide under some phony liberalism to support the oppressors and perpetrators of these immoral acts by blaming the Igbos for asking for Biafra. My father, the late Ogbu-Nwachima once told me that any man who would make no effort to address your grievances before asking you to make up and embrace your opponent, is more dark hearted than the one he is trying to reconcile you with. Those so called intellectuals who said nothing when Buhari publicly flouted Justice Adeniyi Ademola's order to release Nnamdi kanu, said nothing when soldiers killed hundreds of IPOB members and bathed some with acid, said nothing when an Igbo woman was gruesomely murdered in Kano and her killers set free by the govt, said nothing in the face of numerous state-sponsored murderous activities of the fulani criminals, said nothing when soldiers killed IPOB members inside Ngwa high school, Aba on Feb. 9 etc but are always writing long epistles on why the Igbos should forget Biafra, those people are evil! They are more devilish than the devil himself! I have more respect for 'Muna', my neighbour's pig than you dishonest morally bankrupt enablers of injustice!